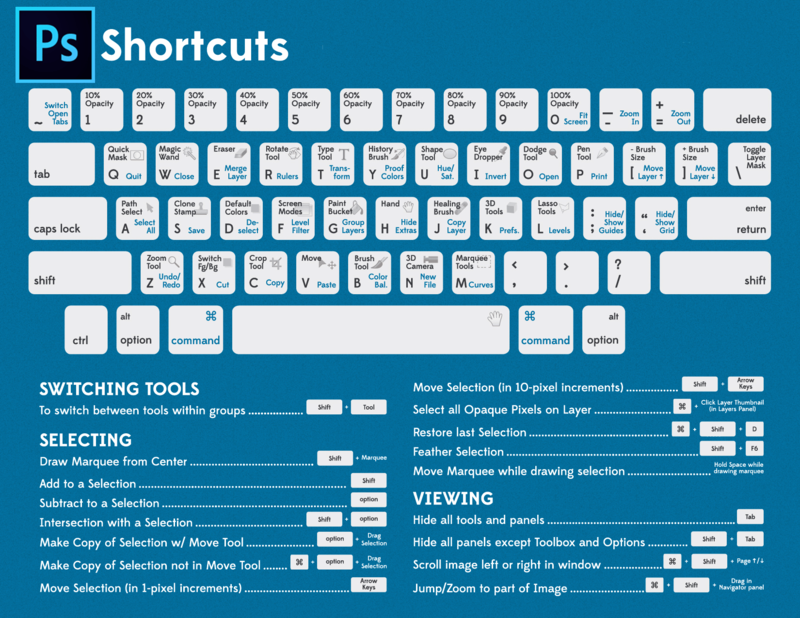 Here are the most commonly used keyboard shortcuts that are vital in speeding up your edits. 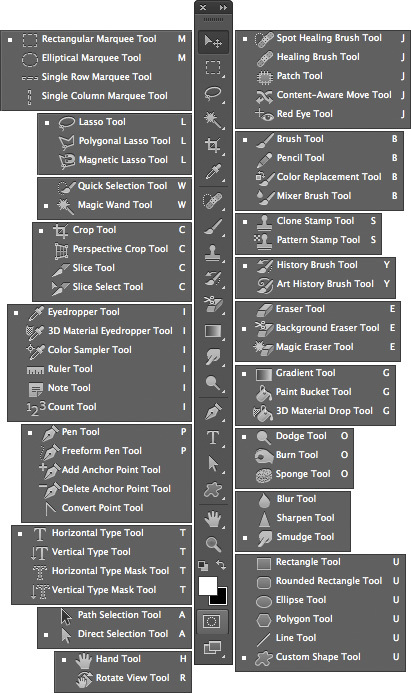 And here’s a list of all the tools available within Photoshop. When you want to draw a perfect circle using the Elliptical marquee, hold Shift. The ellipse will turn into a circle. Although it’s not very common to lose a selection, it sometimes happens. The simple selections aren’t a big deal but when you just spent a lot of time making the perfect selection and you lose it, it can be very frustrating. Press Control + Shift + D when you’re using Windows or Command + Shift + D on Mac. There is an easier way to sample both background and foreground colors with Photoshop CC. Instead of just clicking on the background or foreground swatch as you used to do, click on the Eyedropper tool and click to sample a background color. Holding Alt on Windows or Option on Mac will sample a new foreground color. It happens all the time; you are making a selection or drawing a shape, and despite the shape looking the way you want, it’s not well positioned. You don’t have to draw your shape over. Keep holding your mouse down, as well as the space bar, to move the selection or shape to where you want. When you have it at the perfect location, release the space bar. Whenever you want to open a file, you usually go to the Menus. However, Adobe keeps adding new shortcuts to make your life easier. When you want to open a file, just double-click on the gray background of the Photoshop window. This will make the File Open dialogue appear. Tired of all the gray in Photoshop? After some time working with the software, you may want to change it up. You can change the color inside an image window to any color you like. Gray (the default), black, or a custom color are all options. Just right-click on any part of the color that surrounds the image and choose the color you want. In some occasions, the selection marquee obstructs your view. So, instead of deleting and redoing it, you can keep the selection, but hide it. Press Control + H on Windows or Command + H on Mac.When you need it back, hit the same key combination. Instead of scrolling through all of the layers in order to find the one you need to edit or move, use auto-select. Hold Control on Windows or Command on Mac and click the layer desired from the canvas. This will automatically select whichever layer your cursor is over. There is also an option to toggle auto-select to always be on (on the upper left hand menu). When you’re using multiple palettes, it may get quite handy to have them placed in certain locations. With Photoshop CC you can move them wherever you prefer. All you need to do is to drag and drop the Palette from the sidebar. Don’t think you have the option to reset default values in dialogue windows? Well, you do. When you want to reset a Photoshop dialogue to their original settings, open the respective dialogue. Then, hold Alt on Windows or Option on Mac. You’ll see that your Cancel button will turn into a Reset button. Find these Photoshop tips and tricks useful (or maybe have some of your own)? Please free to comment and let me know! And don’t forget to subscribe to the weekly newsletter to stay updated on the latest tech articles like this one.